When my sister and I were little girls, my mother would sometimes let us play with the hose in the back yard. One of our favorite games, well, one of my favorite games was to walk down the rainbow. One of us would hold the hose and direct the other to walk either to the right or the left as needed to walk down the rainbow created by the hose. I was mesmerized by the sight of my sister running down a rainbow. The sun's radiation comes into the earth's atmosphere at all visible wavelengths, and some non-visible wave lengths as well. When you have an even dispersion of all colors of light, the effect is blindingly white. As light travels through water, it is slowed. Different colors of light are slowed at different rates, depending on their wavelengths. That is why the white rays that entered the spray of water together, leave at different angles separated neatly by color. In pre-school language, when you bend light, the colors come out. Your clap-able word of the day is diffraction: the bending of waves. 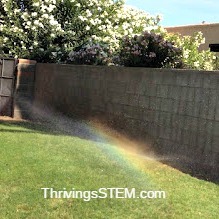 I love this picture - and great explanation of how rainbows are created! Such a beautiful picture and a great way to take advantage of a teachable moment - thanks for linking up! Thank you! I found you the same way and followed you the other day!